What causes bread dough to "rise"? The Fungi Kingdom contains molds, mildews, rusts, smuts, yeasts, and mushrooms. Most fungi are saprophytic or parasitic. The saprophytes are helpful because they break down organic material returning nutrients to the soil. Yeasts are useful in the making of bread and fermented drinks. Some parasitic fungi are actually human pathogens, causing athlete's foot and ringworm. Hypha - the vegetative filament. The fungi cell wall is made of chitin, a complex polysaccharide found in insects. This distinguishes fungi from plants, which have a cell wall made of cellulose. Mycelium - a mat of interwoven hyphae. 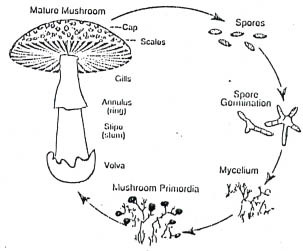 The life cycle of a fungus begins as a spore (the reproductive body) that grows when conditions are right. Out of the spore wall grows a hypha, that looks like a clear, microscopic fingertip. The body of the fungus is made up of a network of hyphal threads collectively called the mycelium. The mycelium grows in soil or within dead wood or living organisms. When growing conditions are favorable, the mycelium develops fruiting bodies, appearing as what we recognize as mushrooms or as other forms. These fruiting bodies will produce the new spores. Fungi reproduce asexually by forming spores. These spores are usually produced by special modified cells at the end of the hyphe. Fungi can reproduce asexually by fragmentation. If the hyphe are broken, the pieces will grow into complete new organisms. Yeasts reproduce by an asexual process called budding. In this process, the yeast cell pinches itself off to produce a small offspring cell. Each of the four divisions of fungi have different forms of sexual reproduction. This topic is covered in Day 2. Unlike members of the plant kingdom that use chlorophyll to produce their own food, fungi do not have chlorophyll and must obtain their food from other sources. Fungi act as parasites and feed on living things, usually doing some degree of harm. Parasitic fungi use enzymes to break down tissues. Examples: the "Honey Mushroom" (Armillariella mellea) and the "Cauliflower Mushroom" (Sparassis crispa). Ectomycorrhizal fungi grow thick coats of mycelia around the rootlets of trees and bring water and minerals from the soil into the roots. In return the host tree supplies the fungus with sugars, vitamins and other root substances. This relationship occurs in more than 90% of plants. Examples: the Bolete Family associated with many species of conifer trees, aspen and birch, and the "Dead Man's Foot" (Pisolithus tinctorius) which helps many plants grow. Endomycorrhizal fungi are microscopic soil fungi that penetrate the cells of plant roots. This relationship may be beneficial to both parties or may be harmful to the plant. Fungi act as decomposers to decay dead plant and animal matter. These saprophytes act as recyclers of dead organic matter, obtaining food from this material. Hyphal tips release enzymes that eventually decompose and release organic materials into the surrounding environment. Saprophytic fungi appear on dead trees, logs, plant litter such as leaves, and even dead insects and animals. Examples: "Gem-studded Puffball" (Lycoperdon perlatum) and "Turkey Tail" (Trametes versicolor). Name the main body parts of fungi. Search the internet and find a diagram of a fungus that you can label with the main body parts (hypha, septum, mycelium). Not just a mushroom reproductive structure. Paste the diagram here. Name several places that fungi can be found growing? Describe the different ways fungi can reproduce (summarize in your own words). Name the different ways fungi can obtain food (summarize in your own words). How do fungi form symbiotic relationships with other plants? What is meant when we call fungi "saprophytes"? Ringworm is a fungal infection of the skin. Use the research links at the bottom of this page to find information to write at least two paragraphs explaining the ringworm infection and how it is contracted (summarize in your own words). The mushroom genus Amanita contains extremely dangerous toxins, giving one the nickname "death angel" Amanita ocreata or "destroying angel". Use the research links at the bottom of this page to find information to write a paragraph explaining each of these things about the genus Amanita: (summarize in your own words). What type of scientists study fungi? Why are mushrooms dangerous to eat? Underground hyphae intertwine and grow upward to produce a reproductive structure called a basidiocarp. This basidiocarp is what we call a mushroom. While wild mushrooms are a highly prized food, because of toxins you should become good at mushroom identification before picking your own. Named for the reproductive sacs or Asci that form near the tips of the hyphae. Ascospores are formed here and released into the air when the ascus ruptures. These spores germinate to form new hyphae. A sexual reproductive stage has not been observed. a fungus and plant roots. Over 90% of plants have fungi associated with their roots. The fungus absorbs and concentrates phosphates for delivery to the plant roots. In return, the fungus receives sugars synthesized by the plant during photosynthesis. Lichens: a symbiotic association between a fungus and a photosynthetic partner, usually a cyanobacterium or green alga. The fungi hyphae provide protection and hold moisture while food is provided by the photosynthetic partner. Upper Cortex: Short, thick hyphae pressed together to form a protective layer. Photosynthetic Layer: In most lichens, the algae are found in a single layer under the protective cortex. Pith: A loosely woven mat of hyphae holding moisture. Lower Cortex: Just like the upper cortex protecting the bottom of the group. Rhizomes: Bundles of hyphae anchoring the group. Name the four Phyla of the kingdom Fungi. Give a brief description of each. How can we make toxic mushrooms nontoxic? What affects does the protoplasmic poison, Amatoxins have on humans? What mushrooms contain these types of poisons? What benefits do plants gain from mycorrihiza? What percent of plants have fungi associated with their roots? What is a Lichen? How does each benefit from the relationship? Give a description of its structure. Write at least two paragraphs explaining why lichens are important to the environment. Write a paragraph giving an example of the importance of fungi in food processing. Yeasts digesting carbohydrates produce carbon dioxide as a waste product. This gas trapped in the dough causes it to expand - "rise". All mushrooms produce chemicals that are toxic, while some of these toxins are much stronger than others.